Please visit the external Boston University School of Medicine Cancer Clinical Trials website for information on current research studies in head and neck oncology. The Center for Innovative Technology (OCIT) is located in the Gilmore/Vines Building at 801 Albany Street, Suite 102. Early detection of oral cancer is critical for successful treatment and improvement of the survival rate. However, current detection is usually done by visual screening and biopsies. It presents a major challenge for even experienced clinicians. Since 1995, our group has been working with Dr. Michael Feld and his group at the Massachusetts Institute of Technology (MIT) to develop a real-time, noninvasive approach by using new laser-induced fluorescence and spectroscopic techniques. Our findings from animal models and patient studies are very encouraging. Now, we are continuing to work on this study to develop new tri-modal spectroscope (a combination of three spectroscopic techniques) and scattering imaging techniques. We expect that our new study will further improve the sensitivity and specificity of diagnosis. We will also explore the feasibility of using these new technologies for intraoperative guidance of tumor surgery and for prediction of the treatment efficacy with cancer chemoprevention. Oral cancer is one of the most common neoplasms, and it is estimated that close to 40,000 Americans will be diagnosed with oral or pharyngeal cancer this year and it will cause will cause over 8,000 deaths. Its slow and cumulative process strongly supports the rationale for its prevention. Chemoprevention is a promising strategy, but its widespread use has been hampered by its significant toxic side effects. Anti-angiogenesis has been established as one of the cornerstones of chemoprevention. Our previous studies have indicated the effectiveness of selective microvascular targeting with a 585 pulsed dye laser (PDL) for tumor inhibition with no damage to neighboring tissue. Importantly, PDL is capable of providing a synergic effect with some routine chemopreventive agents (i.e., retinoic acid) via its ability to selectively destroy existing microvasculature in targeted tissue. In our preliminary studies, a combination of PDL and chemoprevention called laser “photo-chemoprevention,” enabled us to significantly reduce the dose of the chemical agent without sacrificing its efficacy for inhibition of tumor growth. We also are testing a new approach for cancer chemoprevention with less systemic toxicity by topically delivering the agent with polymer “biofilm.” Our long-term goal is to develop new and effective treatment with fewer side effects for chemoprevention or early treatment of cancers. Our group has been working on testing new laser or other techniques for more than 10 years to develop less invasive surgery or selective targeting therapy for head and neck diseases. Currently, our studies include (1) laser photothermolysis of vocal cord scarring. We are using an antibody-targeted laser photolysis to avoid or reduce hypertrophic scar growth in vocal cords. This method will allow us to apply highly-selective targeting while sparing neighboring tissue from collateral damage with diode laser surgery; and (2) less invasive laser surgery for laryngeal papilloma and vascular lesions. We will use a pulsed dye laser to selectively destroy the lesions while preserving the voice function. Download the research study on pediatric patients with laryngeal papillomatosis. 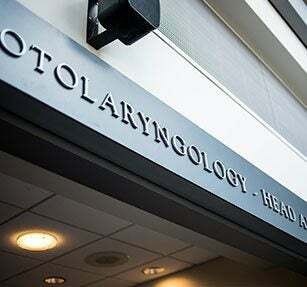 The Center for Voice and Swallowing Research is located on the 4th Floor of 820 Harrison Avenue, with a clinic in the 1st Floor of 830 Harrison Avenue at Boston Medical Center. For more information on this research, please visit the Center for Voice and Swallowing website.